Affordable High Quality...T&E Pro Stock/Pro Mod Trailers at Special Pricing! 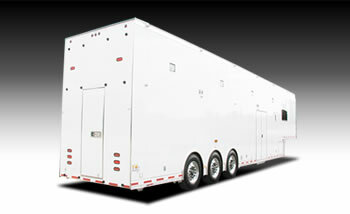 T&E All-Aluminum Pro Stock/Pro Mod Semi Trailers are another of our versatile solutions for multi-car race operations. These trailers are in use by Sportsman Class as well as Pro Class Racers. What most trailer buyers don’t know however, is that T&E All-Aluminum Trailers are more affordable than you might think. When priced option for option, a T&E trailer can be purchased for nearly the same money as lessor quality trailers, but with superior engineering, quality and durability. Visit our Semi Trailer Photo Gallery to view some of the units we've built for our customers or go the Trailers Page to view detailed information about our complete line of trailers. T&E offers a full range of All-Aluminum Trailers to meet the needs of Professional and Sportsman racers alike and we build what we sell. If you're into lightweight, high strength, long-term durability and professional features, contact T&E Auto Haulers today. ALUMINUM FUEL TANK FOR GENERATOR – 40 GAL. ADA BLACK RUBBER FLOOR TILE – BLACK DOT FLOOR ON ENTIRE 1ST FLOOR – 328 SQ. FT.
* Price does not include any applicable State or Federal taxes. * Trailer will be equipped with NHTSA conspicuity reflective tape.